Tomorrow is the last day for Anthropologie’s 20% off coupon!! 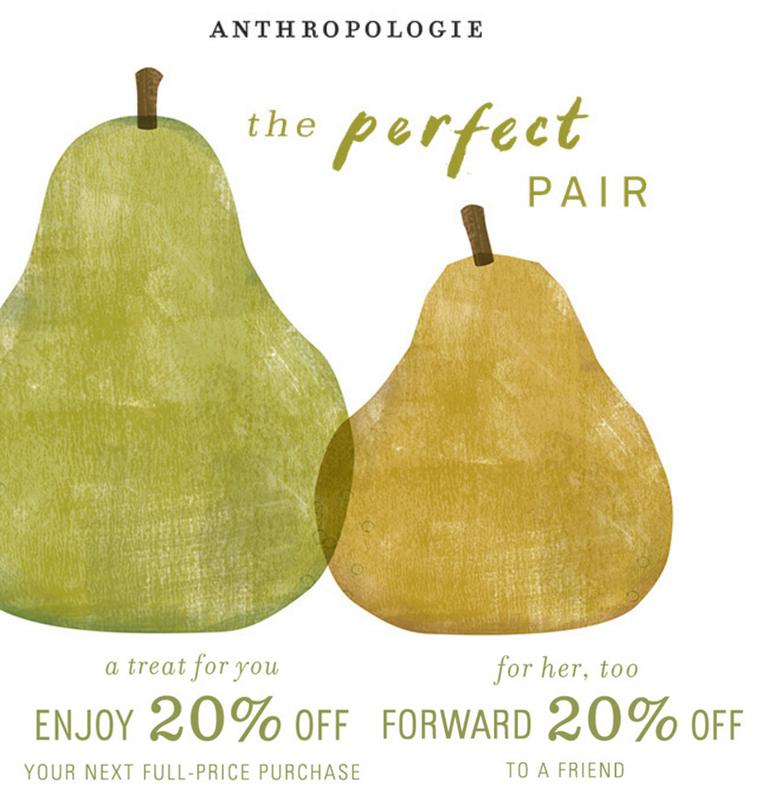 Tomorrow is the final day to use your 20% off perfect pair coupon at Anthropologie! February comes to an end tomorrow and so too does Anthropologie’s perfect pair coupon, a 20% off your full price purchase coupon and the another coupon to share with a friend! This promotional coupon should have arrived in your email on February 10th to use online or in-store…if you didn’t receive a coupon, community members have been wonderful about sharing codes they’re not going to use themselves in the comments! The Elizabeth Denim Jacket ($178) is a unique, cute take on the denim jacket. Note: This post was written before I left for Costa Rica. If any items in this post have hit sale, therefore making them ineligible for the perfect pair promo code, please accept my apologies! 1 | The Elizabeth Denim Jacket ($178, above) is a fantastically feminine take on the classic denim jacket! I love the mix of Elizabethan influence. What a cute jacket! I took a large in this one. 2 | Although not knee-length, the Geo Eyelet Shirtdress ($148) is longer on me than the model and makes a great work dress! I love to wear mine with black tight and cute pumps. I took a medium in this. 3 | If you are on the shorter side or small-busted, the Darcy Pullover ($98) is a very cute transitional sweater that will work nicely for these last days of winter and spring’s chilly greeting. 4 | Likewise, the Solenne Tiered Blouse ($88) is a gorgeous top for the petite and small-busted among us. 5 | The Metallic Bomber ($118) in navy is a fun and frisky jacket, great for wearing over anything from tees to dresses. 6 | If you haven’t already purchased the Embroidered Field Jacket ($168), now would be a fine time to get this pretty jacket at a discount! 7 | The Roe Open-Shoulder Top ($98) is the hint of spring and summer calling! It runs true to size, though if you want it to be less voluminous you can safely go down a size. 8 | Looking for something classic and cute? Then I recommend the Meg Scalloped Tank ($58), which comes in several cute colors. 9 | Likewise, the Silk Swing Cami ($58) is a winner that’s available in several colors. I found this one close-fitting around the hips, my usual medium just works on me! See it on me here. 10 | Let’s talk about some more Anthro jackets I love. The Pilcro Denim Jacket ($138) is top-rated with good reason! I sized up to a large for a comfier fit through the shoulders, and more length. 11 | If you want a versatile moto jacket in your closet, I can’t say enough great things about the Faravel Moto Jacket ($148)! See it on me here and here, and soon in another OOTD! 12 | The Blocked Sherpa Bomber ($148) — especially the grey color — is a fun and stylish coat sure to complete many an outfit. 13 | If you only try one kimono ever, make it the Livia Textured Kimono ($148), which is thicker in texture than most kimonos complete with a beautiful sash that has double tassels at both ends. See a quick fitting room picture of it on me here. 14 | The Flora Nikrooz Paige Robe ($88) is exactly what I want to do my hair and makeup in before a date or a big event. Truly, all things Flora Nikrooz are lovely!! 15 | The Pleated Linen Tank ($98) looks amazing under denim jackets or cardigans, and runs true to size. It’s cropped to be sure, but pairing it with another layer and high-rise bottoms works perfectly to bring the ruffle out. 16 | The Alice Asymmetrical Slip ($68) makes a cute dress too, especially paired with a denim jacket! 17 | No reviews yet and I haven’t seen this one in real life…but the Circle-Knit Cardigan ($148) looks beautiful. 18 | Tiny does understated dolman sleeves wonderfully in its Hazel Top ($88). 19 | I’m so in love with my Pilcro Washed Chino Skirt ($88)! It’s sure to be a warm-weather staple for me. 20 | Need shorts? I love the many colors of the Relaxed Chino Shorts ($58). The Stone Stacking Rings Set ($68) takes all the hard work out of assembling a stacking ring collection. It’s available in 3 different combinations. Shown here, turquoise. 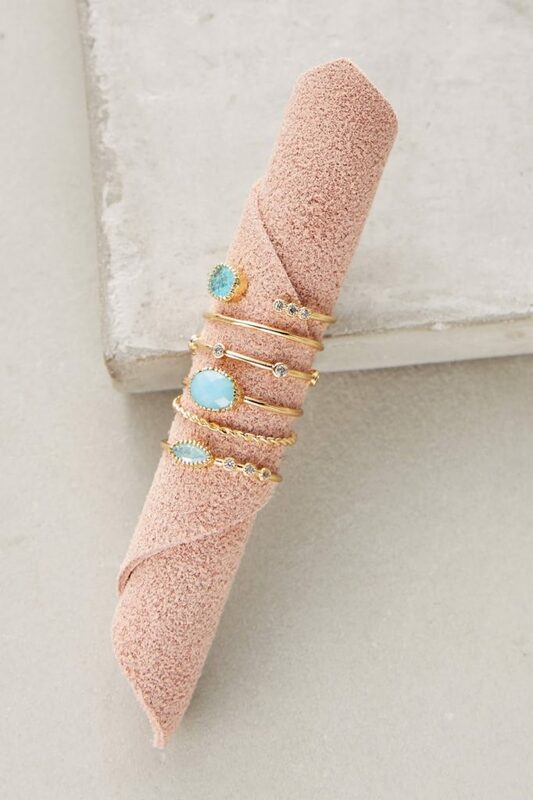 1 | I love the Stone Stacking Rings Set ($68) so much, I purchased all three colors of it! 2 | I also like the way the Opalescent Sunburst Ring ($48) looks on my fingers. 3 | On the tiny side, the Kianne Double-Stack Ring Set ($38) is perfect. 4 | The Ara Stone Choker ($148) is a beautiful, delicate touch to any outfit. 5 | The Everitt Post Earrings ($32) have a dainty quality to them with just a touch of sparkle. I love it when they catch the light, and my boyfriend’s attention! 6 | The light layers of the Layered Velvet Necklace ($54) are a great finishing touch to any outfit. 7 | I haven’t seen them in real life, but I love the look of the Rose Quartz Pendant Choker ($188) and the Quartz Pendant Choker ($188) online! 8 | The Verena Pendant Necklace ($58) would look great over high necklines or simple tops. 9 | Simple and cute, pair the Layered Opal Necklace ($48) with a v-neck top for an attractive yet subtle statement. 10 | How cute are the Alma Mini Tassel Earrings ($88)??? 11 | The Nicola Cuff ($38) is technically a bracelet, but I’ve been wearing mine as an arm band. 12 | If you’re going to use this promo code may as well use it on something big, right? I suggest the Aves Collar Necklace ($508). 13 | Although the exact look of the stone varies from necklace to necklace, I’ve seen so many cute variations of the El Raval Necklace ($88)! 14 | Astonomically speaking, the Star Chart Layering Necklace ($58) is universally adorable. 15 | I love my Mallory Front-Back Earrings ($48)! One note: the stud stone is a light blue opal, not clear like the baguettes. 16 | Solid or sparkly, I love that the Reversible Leather Tote ($188) can go two ways! 17 | I find this Tweedy Backpack ($98) absolutely adorable. 18 | Small and colorful, the Delphi Crossbody ($120) is the perfect small around-town purse. 19 | I haven’t seen a ton to love in Anthro’s shoe section lately but these Billy Ella Ghillie Printed Flats ($168) are pretty neat. 20 | The Klub Nico Milicente Block Heel ($198) are very versatile thanks to their denim blue color and shiny heel accent. They can easily dress an outfit up or down. What are you getting in the last days of the perfect pair promotion? What can you recommend to the community? If you have a code and don’t plan to use it, please share it in the comments! And if you need a code, this is the place to ask for one! If you use, please reply that you used it. Here's a code up for grabs. I'll likely post my second one later or tomorrow as well. Please let everyone know if you use it! Actually, it appears to have been used. So I never received and email, BUT I did receive the coupons by mail! Would love a code if anyone has an extra! My jewelry orders are slowly getting cancelled and one hasn't shipped for a week. Oh well…. Yep something odd is going on with some of the jewelry. I've seen the same “last pair” of earrings and necklace go in and out of stock for a week now. Yes I noticed this as well, I ordered a necklace almost two weeks ago and it's still not here, I guess on back order until March now maybe. Thank you! I used the second one. got the 1st one thanks! Just used the top code. Thanks so much, I really appreciate you posting the codes. That chair is gorgeous!!! WOW!!! i just used this one- thank you! I love the Odillia dress! Does anybody know how Kachin fits? I have one other dress from them and it ran TTS for me in my regular size 6. I'll have to wait to see how this one fits but as soon as it shows up, I'll be sure to let everyone know. used the second one. thank you!! I just used the first one! Thank you thank you thank you!! The dress I ordered popped back and I bought it right away as it was the only one. But it was back ordered until April 1st. Does that mean it's really going to ship? I called CS and the kid said that means that it will show up at the warehouse then but I'm not convinced. A whole month? I want to buy two chairs…anyone have a coupon they can share?! I used this. Thank you :)! Thank you! You just saved me $325! Anyone else have a code to share? My cart is full & I'm ready to pull the trigger. Thanks to everyone who has shared their codes!! I would love one too if anyone has a spare. I've been waiting for a promo to place a big order… Thanks so much! Used second code. Thank you very much! Hi, If anyone has a code to share I'd love one to use in store today. if you have one to share please email to periwinkle832@gmail.com Thank you!! Here's my last code ladies. Enjoy! Thank you Lindinha!! I was able to use it in-store! Just comment if you take it please. Thank you, Christy. I used the code! Thanks! So I'm usually a 2 sometimes a 4 and wonder if 2P will work. I'm sorry I missed out on it originally. There are no 0P's anywhere to be found. used it – thank you! Anyone still have a code they'll share for this late to the party straggler? Any extra codes floating out there? Wow, thanks so much! I'm using the first one. THANK YOU!! Do you all think there will be fresh cuts tonight or tomorrow? Just a quick vent…there are actually a couple new things that I may actually like however they only go up to size 12. I've noticed more and more item have a limited size range. Not cool Antthro! You need all the customers that you can get don't alienate those of us on the larger end.